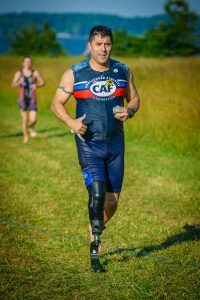 Hi everyone, my name is Luis Morales, I’m a husband, father, paratriathlete, and a veteran. I served in the Army as a Special Forces Green Beret and Airborne Ranger for 20 years. Long story short, I was shot twice in Afghanistan and now I’m a below the knee amputee. Four months after amputation, I did the Boston Marathon on a hand cycle. But that was only the start. A friend volunteered to be my Triathlon coach and start my training plan. Since then, I’ve completed a few Pool Sprints, a lot of Open Water Sprints, Olympics, and Half (70.3) distance Triathlons. I’ve even finished a weekend double and competed in a few USAT Paratriathlon Regional Championships. My family comes out and helps and cheers at races. 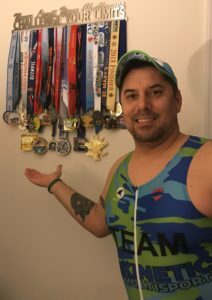 Through all of these experiences I’ve found a calling in advocating for Paratriathletes, so if I can do it, you can do it.